Are you here for some reliable, sturdy and comfortable pair of boots? Do you constantly have to climb electrical poles, put on climbing straps and work long shifts? Then you need the best climbing boots for a lineman. These boots are different from regular work boots because they offer you increased protection and safety in your work environment. They’re also outstanding in what traction is concerned, as well as really comfortable and overall light. Sounds like something right out of a marketing textbook? Well, I promise you can actually find a pair of boots like that. Just read the short buying guide below to figure out what to look for first. Then, read my lineman boots reviews, I have something for everyone. And not to toot my own horn, but I emphasized the cons along with the pros, so you can make an informed decision. Work as a lineman is one of the most dangerous jobs I can think of honestly, with you having to constantly work with distribution lines, climbing up and down electrical poles. So the number one feature you should look for throughout the lineman boots reviews below is safety in your work environment. So ask yourself this: what are the dangers that you face every day at work? Of course, the first one that’s obvious for everyone is the electrical hazard. That’s why you need quality boots with amazing insulation, as well as a protective toe that meets the safety standards in place. Basically, the code you should be looking for is ASTM F2413, which is the latest approved one. Along with his code, you should read the letters EH which signify protection against electrical hazards. But the reinforced toes of your boots can also be Cd and/ or SD rated, meaning they don’t conduct electricity and that they can face static discharge. You need quality lineman work boots, and some of the best are waterproof. But remember that there are various degrees of waterproofness, meaning that a manufacturer can say that their boots are waterproof even if they’re just water-resistant. So my advice is not to get 100% waterproof boots only if you’re sure the chances of it raining while you’re at work are really, really slim. Otherwise, even a summer rain can still make a puddle at the bottom of your pole for you to step in. Besides, we all know that water conducts electricity. Basically, even the smallest amount of water getting in your work boots can put you in danger. Since you’re here after the best lineman work boots, you need really good traction so you can climb up and down easily enough. That translates into a quality outsole, first and foremost. Of course, you need to think of the materials used for making the outsole, and I really like rubber and Vibram for the job. Not only do they not conduct electricity, but they also provide an amazing grip and they’re very durable against the constant wear and tear. Apart from that, good traction is provided by a good design. An ergonomic shape for your outsole will allow you to bend your feet however you want to climb up. A lug sole design is also one of my personal favorites because lugs create more friction, so you won’t slide off wood or steel. Some people out there don’t think that comfort is an essential feature of work boots, but count me out of that bunch. I think that comfort is a top priority for lineman because uncomfortable pole climbing boots bring about all sorts of aches and pains. That means you won’t be as dexterous when climbing up or down, but you’ll also lose your concentration if your brain has you focusing on the pain. So what makes a boot comfortable? Firstly, I would say choosing the right size, so make sure you read the size charts provided by the manufacturer really carefully. A reinforced toe might make the toe box a bit smaller, and render some boots a bit narrow. But you need the right cushioning and padding in all the right places, like around your ankles, on your insoles and around the heels. Still, I hate it when this padding is simply thrown there for the sake of marketing instead of following the anatomical shape of how our feet look like. And don’t forget that too much padding can actually make your feet boil if you’re working in high-temperature weather. Raise your hand if you want to buy a new pair of boots every other week. No takers? That’s right, Captain Obvious thinks you need durable work boots, but that means investing in a quality pair that can face your harsh work environments. With that in mind, you have to choose the best materials. And don’t shy away from getting a brand name. 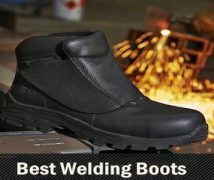 Nowadays, most brands manufacture quality products, and you can definitely find the best lineman boots for the money. So leather for the uppers, steel for the shank, a Goodyear welt and a rubber sole can easily be found in a budget pair of lineman boots. This might sound like a whiff, but if you’re like me, you want to get things done fast. Now, I know wearing a pair of new work boots to work right out of the box is virtually impossible, but still. I think a good breaking in time is about a week, two weeks max. So how can you have support without rigidity? A steel shank, for instance, is really important to keep your ankles steady and prevent you from wobbling, but it can prolong your breaking in time. Well, you want some cushioning with that shank too, especially in the ankle area. Apart from that, support entails a thicker outsole that steadies you on rugged terrain, as well as a high enough shaft. 8 inches should be enough to protect your shins, but 16-inch lineman boots are even better. And if you have tendonitis or plantar fasciitis, make sure you get a supportive insole. I’ve talked about how important waterproof boots are for linemen, but they should also be breathable. The thing is this: lineman boots should be insulating to protect you from work-related hazards, but most insulating materials stop ventilation because the air coming inside your boots makes them less insulating. Same goes for waterproof materials. 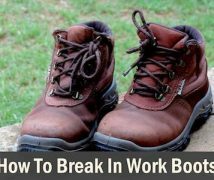 So you need to make sure that the inner lining of your work boots is moisture wicking, meaning that even if you sweat, you’re not getting your feet all damp. Another thing you can do is not to choose a pair of really warm boots if you’re working in terribly hot weather. Take Thinsulate for example, which is a really nice, affordable insulation I personally love because it’s so well-performing and light. But it’s hot as hell, and not so breathable, so you’d better avoid it if you’re working in extremely hot temperatures. Let’s see if we can find you some really good pole climbing boots too, shall we? If you’re looking for supportive lineman boots with a steel shank that offers you the desired rigidity for constant climbing, as well as increased comfort for long shifts, the Red Wing Men’s Iron boots are great for the job. I love the way they look, really stylish, and the leather uppers are really durable for constant wear and tear. On the other hand, as you can read in the manufacturer’s instructions, the uppers can get scuffs pretty fast. But the good news is you can easily rub them out using a soft dry cloth and gentle movements. The shaft is only 6-inch high, a bit short for my taste, but it can still provide awesome support. I also love the supportive 1-inch heel and 0.5-inch platform if we’re discussing this aspect. All these features really contribute to an easy climb and cushion impacts. The Nitrile Cork sole I could marry, it shows that this is a more expensive pair of boots. Nitrile Cork is one of the best materials used for the outsoles, incredibly light and yet offering great traction. Besides, the stitch-down welt with contrast stitching looks awesome; it definitely shows that these boots were handcrafted in the USA. I also like the protection factor, although I’m not seeing an EH-rating here. But the bump toe, with its double layer leather toe cap and leather heel pocket, definitely offers you enough protection against bumps and small impacts. And these things also comfortable, just like the leather insole which prevents foot fatigue, but make sure you choose the right size since Red Wing is famed for running a bit large. If you’re working in really bad weather, the Men’s Eureka from Hoffman Boots are some of the best climbing boots for a lineman. That’s because they’re entirely waterproof, and also boast a waterproof lining that shows attention to user experience, in my humble opinion, as you don’t need water getting inside your boot through the lining. But the thing I love most about these boots is their dual steel shanks. If that doesn’t show durability and support, I don’t know what does. Plus, these sorts of shanks are great for climbing, offering support even in slippery conditions. And the 10-inch shafts can definitely keep your ankles steady during your shifts, but remember that these boots run a bit big too, just like the Iron Rangers above. There are also the reinforced steel toes to show how durable and protective these Hoffman boots are. They’re ASTM F2413-11 rated against impacts and compression, as well as EH rated against electrical hazards, so you win the jackpot. These are some really versatile boots, and you can wear them for other jobs too, not just work as a lineman, and that bumps up the retail price. The materials used for making these boots tell me these are really quality. Take the 2.8 – 3.0 mm top-grain leather used for the uppers – this is flexible and yet protective against scratches and punctures, as well as waterproof. The rubber rand is another example of a good material for great traction and support, but all these materials, along with the steel shanks and steel toe add to the overall weight of the boots. These La Sportiva Men’s Karakorum Hiking Shoes sport a few amazing features that really convinced me. But be warned, all these come at a great price: the actual price, which places them among the high-end boots on the market, right alongside the Hoffman Men’s Eureka. Take the Idro-Perwagner silicone-impregnated leather uppers, for instance. This is way better than the leather used for manufacturing the Men’s Eureka since it’s highly flexible and more resistant to punctures thanks to the added silicone. However, there’s no reinforced toe to speak of, so these boots are less protective against work-related hazards. Still, they’re really comfortable for climbing stairs or poles and generally working on rugged terrain. Heck, you can even take them out hiking or rock climbing, especially since they’re compatible with hybrid crampons. And I personally adore how light and comfortable they are, really showing an anatomical design. The multi-directional 3D flex hinge helps you bend your feet however you want to climb better, but also keeps your ankles steady. Besides, the anti-torsion plate really absorbs impacts. But I also love the rubber Vibram Couloir outsole thanks to its wonderful traction and low weight, as well as how good it looks. Plus, I can’t ignore the very cushiony and anatomically supportive polyurethane Aircushion midsole, that also lets your feet breathe. Speaking of which, the Dri-Best lining is what will keep your feet dry for long hours on the job, considering its highly moisture-wicking capabilities. Combine that with the Cordura cuffs as the La Sportiva people did, and you get a snowproof, waterproof, breathable pair of boots that work great in inclement weather. However, these are definitely not summer boots, and you might need to take a bit of time breaking them in. If you want good value for money, you can’t fail with the Carolina Logger boots. To start with, they’re really versatile, you can even use them for logging, which is a terrific thing if you’re working more jobs. But these boots are also great for linemen, especially considering they’re EH-rated so they can protect you against electrical hazards. With their soft toes, you can rest assured these boots are comfortable right out of the box, so they don’t need a breaking in period. They also run true to size, so that’s another relief if you don’t want to spend time browsing reviews and size charts to decide what you’re getting. Plus, Carolina is famous for manufacturing quality, durable products. The leather uppers are really amazing, they’re resistant to punctures, abrasions, and water. Besides, the 100% waterproof membrane is a really nice, user-friendly addition for the price. Just keep in mind that these boots are uninsulated, so they’re not great in extremely cold weather. And I love the lug sole design, which is great for increased traction. However, the high heels, I don’t really dig for climbing, unless you’re used to this sort of design. But the steel shanks and 8-inch shafts are really supportive, and that’s definitely a plus here. The Danner Men’s are another example of reliable, yet affordable men’s lineman boots, just like the Carolina loggers. And these also have versatility in common; you can easily use them felling trees thanks to their wonderful characteristics that make them great for climbing. Still, they’re not that great for walking or hiking. But let’s see what recommends them for the job. Their rubber soles provide a great grip, and I’ve already talked your ears off about how much I love rubber for climbing purposes. The 10.5-inch shafts are another feature I like in terms of support, but the Bi-Fit board is the real feat. Thanks to this, the heel stays put, but your forefeet can still move around with much-needed flexibility for climbing poles. And unlike the Carolina loggers, these boots are perfect for colder weather. That’s because they come equipped with 400G Thinsulate Ultra, which is a really, really warm material. The Danner Dry waterproof protection is a signature feature of the Danner brand, and it’s great for when it’s raining or snowing. On the other hand, remember that this is Nubuck leather used for the uppers. So even if the uppers are oiled and thus coated to waterproof them, you’ll need to reapply a layer of coating at least every other week to re-waterproof these boots. But if you can bad-mouth the water protection these boots offer, I can still give them 4 out of 5 stars for overall protection. That’s because these boots are equipped with reinforced compound toes, which meet the ASTM F2413-11 M I/75 C/75 EH standards. So you’re getting a pair of light, non-metallic work boots that can protect you against impacts, compressions, as well as electrical hazards, at an affordable price. I love these pull-on lineman boots because of how versatile and comfortable they are. Besides, the Arian Mens Powerline H20 are really of industrial grade, and that’s all thanks to the quality materials used, starting with the impermeable leather uppers that can fight off scratches and punctures as well as water. The lug sole design looks and feels great, offering you a great grip when you’re climbing. And thanks to the Advanced Torque Stability Pro feature, you can benefit from increased movement flexibility without sacrificing ankle stability. Isn’t that neat? Moving on to protection, these boots boast a composite toe that meets the ASTM EH ratings in place. 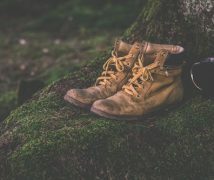 Plus, a composite toe also offers you some protection against impacts and compression, which is why you can use these boots for other jobs, like felling trees or working constructions. I also love that the rubber sole is oil and slip-resistant, which makes these boots great for climbing as well as navigating rugged terrain. And thanks to the Waterproof Pro lining, you can make sure your feet are well ventilated, as well as kept safe from rain. There are two other features that really stand out and distinguish these boots from other similar models on the market, though. First, the extra-wide shank can offer you good stability, but also makes these boots comfortable. Second, there’s the diamond plate pattern rubber piece at the heel area, which is a gift from heaven for climbing straps since it prevents them from sliding off. But there are also two features that render these boots less than perfect. For one, they run a bit small, so you’d better choose half a size bigger. Second, they’re a bit difficult to put on because of the rubber cap at the heel, but that’s still faster than tying up your laces. Still, if you choose the right size, I’m sure you won’t have any problems slipping these boots on. As you can see, I discussed some really different climbing boots for linemen, but now it’s up to you to choose the model that fits your purposes. And I hope that the buying guide I started with can help you do exactly that. I also told you a bit about my likes and dislikes in this article, so I’m really interested to hear more about your preferences. What are you looking for in a reliable pair of climbing boots for linemen? Which pair caught your eyes from the reviews above?